By entering you are agreeing to this site using your image in the round up, and us pinning entry to Pinterest. Remember to respect others’ copyright. 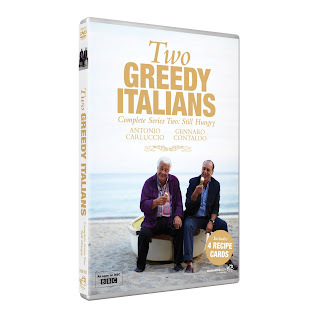 I have one copy of the DVD 'Two Greedy Italians- Still Hungry', which I reviewed last month, as a prize for one lucky entrant who will be chosen at random once the Linky closes. In Episode 3 ' The Alps and Arrangiarsi, Antonio and Gennaro go foraging for ingredients and live off their wits and the land so I felt it was really quite appropriate for Credit Crunch Munch! As hosts and guest host, Fuss Free Flavours, Fab Food 4 All and Farmersgirl Kitchen entries will be excluded from the prize draw. Tell me about your money saving ideas on the linky below! I am also making this a blog hop, so feel free to grab the code and add to your post too. Let’s spread the money saving meme!We’ll be looking for guest hosts later in the year, so please mail helen at fussfreeflavours dot com if you are interested. THERE SEEM TO BE A FEW ISSUES WITH THE LINKY. IF YOU CAN'T GET IT TO LINK, PLEASE LEAVE A COMMENT WITH A LINK TO YOUR RECIPE. THANK YOU. Ooh nice prize Janice. Hope to be posting an entry tomorrow. It is a great prize and some tasty entries. Have fun choosing a winner.